McLuhan and the arts is a well-trodden theme yet surprisingly still fertile ground for original scholarship and research-creation. Milestones include excavations by Richard Cavell and Elena Lamberti of the aesthetic sources of McLuhan’s media analyses in the literature and visual arts of his time as well as his influence on a range of contemporary artistic projects, from happenings to installation art. Janine Marchessault and Donald Theall have also presented compelling portraits of the media thinker as himself an artist or “poet-artist manqué” (Theall, The Medium 6). More recently, case studies of specific artists and movements inspired by McLuhan—notably Kenneth R. Allan’s exploration of McLuhan’s notion of the “counterenvironment” as a mode of immanent critique practiced by conceptualists ranging from Dan Graham to the Vancouver-based N.E. Thing Co. Ltd.—have lent additional definition and texture to existing accounts of the longue durée of McLuhan’s influential percepts. Yet no authoritative survey of McLuhan’s global impact on contemporary art has emerged to-date. This special issue of Imaginations does not, and for reasons of space alone cannot, fill this gap. Nonetheless, the articles and artists’ responses gathered here, both collectively and individually, constitute a significant advance in our still evolving conception of McLuhan as a thinker and practitioner of aesthetics. A notable acceleration in the uptake of McLuhan’s thought in recent years points to something of a mutation in the trajectory of recovery, restoration, and revision initiated by the publication of his Letters in 1987. It has become commonplace to attribute McLuhan’s post-contemporary revival to the forces of retrospection and reassessment focused by centennial celebrations of his birth in 2011. Yet there is more than chronology driving this renaissance. Richard Cavell has recently drawn parallels between McLuhan’s thought and contemporary affect theory and new materialisms. It is also not coincidental that McLuhan’s thought experiments have been the object of renewed attention amidst the intellectual sea-change spelled by the speculative turn. While it would be dubious and unfruitful to retrospectively claim McLuhan as a new realist avant la lettre, compelling resonances between his transgression of disciplinary boundaries and present-day intellectual currents illuminate some of the leading concerns propelling the present special issue of Imaginations. If the 1990s gave us a “virtual” McLuhan who was simultaneously a philosopher of difference and a forerunner of the spatial turn, today the media analyst is ripe for reevaluation as the generatively unclassifiable thinker that he is. In common with the proponents of various Speculative Realisms, McLuhan’s writings are characterized by a profound weariness of the “Subject” produced by Enlightenment epistemologies and conserved, if profoundly reconfigured, by the linguistic turn which coincided with the waning of his own reputation after 1968. “Man” may be the unapologetic subject of McLuhan’s media explorations, yet it is no liberal-humanist individual—no Vitruvian Man—that emerges from his collagiste prose. Rather, McLuhan presents us with an oddly prosthetic and generic humanity that anticipates the contemporary French thinker François Laruelle’s provocative contention that “there are no longer subjects” (“Is Thinking Democratic?” 233). Likewise anticipatory of Speculative Realism, McLuhan drew upon a range of scientific discourses to expand the scope of humanistic study beyond the confines of Greek metaphysics and Judeo-Christian theology. In particular, McLuhan emerges as a prescient critic of linguistics as the master signifier of the human. For the Toronto School thinker, as for contemporary realists, “ontology is politics” (Bryant, Srnicek, and Harman 16)—an orientation made plain by his prefatory profession of faith in “the ultimate harmony of all being” in Understanding Media (5). Yet McLuhan’s non­­-Kantianism—derived from Henri Bergson, as traced by Stephen Crocker—thwarts any meaningful alignment with contemporary neo-Kantians such as Graham Harman or his noumenal world of “objects.” It is, rather, the eccentric project of “non-philosophy” elaborated by Laruelle that comes closest to McLuhan’s non-standard humanism and best illuminates the experimental currents propelling this special issue. Laruelle (b. 1937) is Professor Emeritus at the University of Paris X (Nanterre). Of his more than 20 monographs, some dating back to the 1970s, English translations have only begun to appear since 2010, although they are now being published at a rapid rate by the most distinguished academic presses. Laruelle began his career by extending but also hybridizing the seemingly incompatible post-structuralist theories of Jacques Derrida and Gilles Deleuze. By the early 1980s, however, he was beginning to push against these “Philosophies of Difference” to formulate his own non-philosophical alternative (discussed in detail below): a rethinking of the central assumptions of continental philosophy that nonetheless makes new, if sometimes unrecognizable and perverse, uses of its now-familiar concepts and vocabulary. Some commentators group Laruelle with Anglo-American thinkers associated with Speculative Realism—an affiliation that the non-philosopher would likely reject. Nonetheless, Laruelle’s project shares with SR an ambition to think beyond such hallmarks of French Theory as the linguistic metaphor and the centrality of the Subject utilizing techniques and terminology derived from science. Like Laruelle, McLuhan is a gnomic thinker who defies standard disciplinary taxonomies and norms. Indeed, McLuhan’s currently accepted designation as a media theorist or media philosopher is questionable, not only on the basis of his own oft-noted resistance to systemization; the Toronto School thinker preferred, like Laruelle, an aesthetic and experimental methodology substituting non-rational “percepts” for the concepts of conventional epistemology. Even the default subsumption of McLuhan’s protean speculations under the rubric of media studies is debatable, if only given his noted lack of training in communications and resolutely literary methodology. Like Laruelle, McLuhan’s project is more accurately characterized as an irreverent bricolage of seemingly irreconcilable methodologies that effects a mutation of the central forms of classical Western epistemology and its contemporary offspring. The formal orientation of McLuhan’s analyses was long dismissed as a methodological shortcoming, a holdover from the naïve formalism practiced by an earlier generation of humanists. Jessica Pressman has persuasively argued for a recovery of McLuhan’s approach as an innovative modality of New Critical techniques of close reading. In light of Laruelle’s trenchant critique of the enduring form of Western philosophy, however—what he describes as its circular, “decisional” structure (the constantly rearticulated yet functionally invariant dyads of Subject/object, Idea/representation, One/multiple, Being/beings, etc. )—McLuhan’s formal methodology emerges with renewed relevance as a perspicacious excavation of the a prioris of Western epistemology and aesthetics. Indeed, there is a strikingly proto-Laruellian orientation to McLuhan’s recognition of the dyadic figure/ground dynamics of typography as an artefact of Western rationalism and its binary apparatus of subjectivization. Anticipating the quantum chaos, or chôra, that Laruelle opposes to the empirico-transcendental doublets of philosophy, McLuhan, himself partially influenced by developments in quantum mechanics, hypothesized a non-perspectival “acoustic space” in contradistinction to the dualistic positions structurally inscribed in print culture and perspectival optics alike (Counterblast n.p.). Paralleling the originary “blackness” that Laruelle attributes to the Real (thereby rejecting standard metaphysical metaphors of illumination and enlightenment), McLuhan described this acoustic space as “the dark of the mind” (Counterblast). Moreover, McLuhan’s acoustic space as well as the “mosaic” form that he developed to communicate its heteronomous essence (Gutenberg Galaxy 265) can both be likened to Laruelle’s insistence upon the foreclosure of the Real to epistemological capture: a “One” that unilaterally equalizes all attempts at its representation as necessarily incomplete. Laruelle’s universe establishes an irreversible vector from the Real-One to its representations, thereby standing on their head the pretentions of philosophers to transform the Real. McLuhan’s mediatic Real is likewise misconstrued as relational. After all, the medium is the message: the terms of this most celebrated yet persistently obscure of McLuhan’s axioms being as irreversible as the variables in Laruelle’s non-philosophical matrix. The medium is a vector that only travels in one direction. In other words, content, always inadequate as a description of the medium and secondary to its effects in McLuhan’s writings, can be likened to Laruelle’s view of philosophy’s doomed attempts at capturing the Real. The conflicting percepts superposed by McLuhan’s textual mosaic issue unilaterally from a non-totalizable mediatic Real. His analyses thereby unfold “alongside” the blackness of acoustic space in a manner consonant with Laruelle’s non-philosophical project (Intellectuals and Power 32). The medium is the message can also be understood as articulating a form of radical immanence; that is, the message does not transcend the medium, but is immanent to its form. This immanental orientation corroborates Donald Theall’s likening of McLuhan’s thought to that of Deleuze, whose 1968 text The Logic of Sense influentially proposed a neo-Stoic reading of the “blank word,” which (like McLuhan’s medium) “says its own sense” (79). McLuhan’s maxim equally resounds in Laruelle’s radical deconstruction of Deleuze’s philosophy of immanence; the former proposing, in the words of John Ó Maoilearca, a thought capable of “doing what we say we do” (45, original emphasis). What more concise description of McLuhan’s medium than that it, too, says what it does? McLuhan elaborated his prescient critique of the dyadic technics of Western thought in a performative style that Richard Cavell has productively likened to performance art. Similarly, Laruelle has stated that, “what interests me is philosophy as the material for an art” (Mackay and Laruelle 29): an aesthetic project that he characteristically qualifies as non-standard aesthetics. The mosaic of quotations assembled by The Gutenberg Galaxy “clones”—as Laruelle would say—its philosophical and aesthetic reference material through a scriptural reduplication that deliberately contravenes the hermeneutic norms of philosophical commentary and interpretation. McLuhan thereby reduces his chosen objects of study (François Rabelais, Peter Ramus, The Tragedy of King Lear, etc.) to so many “simple materials” (Laruelle Principles of Non-Philosophy 9) or, what he would term with Wilfred Watson, “clichés,” stripped of their pretentions to transcendent Truth. This citational procedure—which sets the stage for Laruelle’s practice of radical paraphrase—powerfully foregrounds the materiality of print as an instrument of rational thought while simultaneously exposing and sterilizing the dyadic representational machinery of Platonic epistemologies more generally. The mannerist theatre staged by McLuhan’s “non-book” collaborations with designers Quentin Fiore and Harley Parker (Michaels, “Foreword” 8) abounds in quotations and images gleaned from a beguiling gamut of pop-cultural and “serious” sources (not to mention their incessant paraphrase of McLuhan’s own earlier, single-authored texts). Precedent for such assemblage is found in the ventriloquism of mass-media formats (comic-strip, editorial, newspaper) and the high-Modernist prosody performed by The Mechanical Bride, the media analyst’s first monograph. Yet McLuhan’s détournement of readymade materials can be traced further back to the anti-Bergsonian (yet, paradoxically, enduringly Bergsonian) rhetoric of Wyndham Lewis: the Canadian-born multimedia Modernist whose impact on McLuhan has been analyzed in depth by Lamberti and is the subject of the recent anthology Counterblasting Canada. Lewis—whom McLuhan first read during his doctoral studies at Cambridge in the mid-1930s, and subsequently befriended during World War II while lecturing at St. Louis University and Assumption College (today’s University of Windsor)—was a prominent critic of the non-logical metaphysics of Bergson. Yet, as SueEllen Campbell and others have demonstrated, Lewis’s anti-Bergsonian polemic remained perplexingly Bergsonian in its mere upending of the driving dualisms of Bergsonian metaphysics: “matter and memory, perception and recollection, objective and subjective” (Deleuze, Bergsonism 53). However, where Campbell and other commentators on Lewis’s fraught relationship to Bergsonian modernisms have tended to view the British artist-author’s enduring if covert Bergsonism as an unwitting inconsistency, it is equally legitimate to recognize in Lewis’s “perverse” (Edwards, “Wyndham Lewis’s Vorticism” 39) Bergsonism a deliberate logic of paraconsistency. A similarly heretical reuse of Bergsonian dualisms in tandem with borrowings from contemporary scientific discourse was made earlier by Marcel Duchamp (see Henderson; Luisetti and Sharp; Ó Maoilearca), whose para-painterly masterpiece The Bride Stripped Bare by Her Bachelors, Even (1915-1923) also informed McLuhan’s Mechanical Bride (see Cavell, Remediating McLuhan 50). Much as Duchamp seized upon the denigrated mechanical and rationalist pole of Bergson’s dualist apparatus to enact an unauthorized, and pointedly anti-vital, reuse of the French vitalist thinker’s conceptual apparatus, Lewis, too, can be understood as appropriating Bergson’s popular writings as “a whatever material” for unsanctioned remediation (Ó Maoilearca 164). Clearing a path for the non-philosophical “clones” of Laruelle as well as the clichés of McLuhan and Watson, Lewis’s heteroglossia of Bergsonian formulas belongs to a Bergsonian tradition and yet remains defiantly non-Bergsonian in its divestiture—and, indeed, overt satire—of the transformational potential of philosophical concepts. In McLuhan’s reworking of Lewisian strategies of pastiche, paraconsistency emerges as a primary characteristic of what he alternately termed “post-lineal” or “post-alphabetic” culture: neologisms that are strikingly consistent with the non-Euclidean model pursued by the egalitarian thought of Laruelle in their radical expansion and mutation (but not abandonment) of the schemata of classical epistemology. In advance of Laruelle, McLuhan was drawn to non-Euclidean models of space that liberated humanity from what he dubbed the “straight-jacket” of the parallel postulate and the constraints of logical consistency, whose “proof” it purported to embody (Counterblast n.p.). In the post-lineal world inaugurated by electronic media, “[a]ll knowledges are equal” (Ó Maoilearca 28), just as no representation of the Real can dominate in Laruelle’s democracy of thought. Much as Laruelle has strategically appropriated theoretical material from the neo-Bergsonian Deleuze, whose imperative (as paraphrased with collaborator Félix Guattari) to “create concepts” (5) he has divested of its metaphysical impulse, Lewis mimicked Bergson’s metaphysics of creative evolution in his 1930 masterpiece, The Apes of God. The latter text stages a carnivalesque pageantry of modernist clones mocking the French philosopher’s artistic acolytes, who are represented as little more than stereotyped “walking ideas” (Edwards, Wyndham Lewis 320). Occupying the perspectival centre of Lewis’s literary vortex is the absentee philosopher Pierpoint (or “peer-point”) (Miller 117), whose insights are parroted by the denizens of Lewis’s counterfeit “society of creators” (Deleuze, Bergsonism 111). Acting as the prototypical medium, the Virgil-like Horace Zagreus “broadcasts” (Apes 271, 418, 433, 434) Pierpoint’s views via mock-radiophonic performances of the reclusive guru’s “encyclical” (125) as he guides protagonist Dan Boleyn through a Dantean Bloomsbury. Lewis’s satirical reversal of the dynamics of Bergsonian comedy (as theorized by the French thinker in his popular essay Laughter)—which Lewis dubbed “non-moral satire” (Men Without Art 107-108) in opposition to the socially corrective function that Bergson attributed to the mechanical essence of the comic—can be likened to John Ó Maoilearca’s description of non-philosophy’s “mockery of the philosopher’s truth” (176): a mockery enacted through a quasi-behaviourist, “postual” miming of philosophical positions (see also Hokenson). Similarly, Theall situated the Menippean satire of academic norms practiced by McLuhan’s irrevent non-books within a tradition of “learned satire” with which he also connected Lewis (The Virtual Marshall McLuhan 41). A key point of tension between the non-Bergsonian mimicry practiced by both Laruelle and Lewis emerges from the latter’s emphatic anti-humanism, which cannot be reconciled with the persistence of the Human in non-philosophy. Laruelle insists that the “non-” prefix which he appends to his minoritarian practice of thought is in no way synonymous with the negation implied by anti-philosophy. Non-philosophy does not aim to overturn or nullify philosophy, but—on the model of non-Euclidean geometry, which accepts the axioms of classical geometry yet adds seemingly incompatible postulates thereto—sets out to expand the scope of humanistic study by multiplying and mutating its disciplinary resources, even at the risk of inconsistency. The persistence of the Human in Laruelle’s thought is framed in emphatically futural terms, as the open question of humanity’s “salvation” (Smith, Laruelle 6), a formulation that recalls the future tense in which McLuhan cast his prophetic pronouncements on social and sensorial transformations that he associated with the proliferation of electronic media. A shared modality of science fiction is an additional manifestation of the two thinkers’ common literary orientation: a re-description of philosophical and extra-philosophical materials that Laruelle theorizes (in reference to his own project) as “philo-fiction.” Refusing to abandon the contents of conventional philosophical discourse, Laruelle instead “superposes”—an operation transplanted from quantum physics—concepts and vocabulary from divergent domains to fabulate novel thoughts that are real but fictive: not authoritative descriptions of the Real but rather fictions composed of statements that, however conflictual or incomplete, are nonetheless real in themselves. A contemporary artist whose work suggests compelling analogies with Laruelle’s practice of philo-fiction is Robert Smithson (1938-1973), whose photo-essays transgress disciplinary boundaries and protocols to spin unreliable narratives cannibalizing the work of other creators. The early Smithson text “Entropy and the New Monuments” is axiomatic in its transformation of a conventional survey of recent art (in this case, Minimalist sculpture) into a free-ranging meditation on the ineluctable fatum of an entropic cosmos, weaving references to everything from tourist guides to Claude Lévi-Strauss into a deliberately anti-academic heteroglossia. Smithson’s compulsive fabulation echoes McLuhan’s reconfiguration of the “critic as creator” (Cavell, Remediating McLuhan 79) through his innovation of the multimodal “essai concrète” (Theall, The Medium 240). “Incidents of Mirror-Travel in the Yucatan,” Smithson’s signature 1969 mock-travelogue, reported on a recent tour of the Mexican peninsula in a satirically hypertrophied impersonation of the first-person narrative conventions of embedded journalism that may have been inspired by the artist’s familiarity with the ironic travel writings of Wyndham Lewis, whom he referred to as his “favorite author” in 1965 (qtd. In Crow 37). “Incidents of Mirror-Travel” is eminently philo-fictive in its superposition of its host text—the 19th-century American travel writer John Lloyd Stephens’s 1842 Incidents of Travel in Central America, Chiapas and Yucatán—with more dubious “histories” of the mythical continents of Atlantis and Mu by James Churchward and Ignatius Donnelly. This pseudo-scientific travesty of Atlantean utopias effects a ludic “revers[al of] Platonism” (Deleuze, Logic of Sense 291). Smithson recounts his temporary installation of “hypothetical continents” along his Yucatán itinerary based on the imaginative cartographies of Churchward and Donnelly: piles of seashells or stone conjuring the conjectured coastlines of the “lost” landmasses of Lemuria and Mu. In thus materializing a specious facticity, Smithson manifests a logic of paraconsistency anticipatory of Laruelle. “Contrary to affirmations of nature,” writes Smithson, “art is inclined to semblances and masks, it flourishes on discrepancy” (“Incidents of Mirror-Travel” 132). “Incidents of Mirror-Travel” simultaneously mobilizes the camera in unconventional ways that clear a path for Laruelle’s discourse on “non-photography” as an instantiation of “vision-in-One,” the French thinker’s term for a unilateral modification of human perception. Photographs accompanying Smithson’s textual account of his Yucatán expedition pointedly depart from the formalist conventions of a medium then struggling to acquire critical legitimacy. Smithson’s defiantly casual photographs redirect the reader’s touristic gaze away from the expected archaeological monuments portended by the title’s nod to Stephens. They record instead an anti-spectacular inventory of sites/sights: ephemeral arrays of square mirrors, or “mirror displacements,” installed by the artist on beaches and the jungle floor. Perversely, these crude grids refuse a specular optics, reflecting instead monochromatic expanses of sky or dazzling solar flares. The rigorous abstraction constituted by the “broken geometry” (127) of these mirrored arrays can be likened to the “matrix” that Laruelle posits as the a priori of a (non-)photographic vision preceding the emergence of the technical apparatus of the camera—which, in his account, is only incidental to a longer trajectory of philosophy’s “onto-photo-logical” unfolding (Photo-Fiction 3). The alternating flares and mottled obscurity manifested by Smithson’s arrays can also be likened to the “blinding of the light of logos by the really blind thought of photography” postulated by Laruelle as a refusal of the representational metaphysics of Platonism (The Concept 58). As Smithson writes, “mirror surfaces cannot be understood by reason” (“Incidents of Mirror-Travel” 124). The non-photographic image theorized by Laruelle as an alternative to the specular optics of conventional photographic discourse is confoundingly “obscure and black” (The Concept 58). Like the non-photographic “clones” of an unrepresentable Real formulated by Laruelle, Smithson’s mirror displacements are, moreover, “empty in general of phenomenological structures of perception: horizon, field of consciousness, fringe and margin, pregnant form (Gestalt), flux, etc.” (The Concept 102). The artist superposes mottled or monochromatic mirrors with generic stretches of beach or jungle to produce not a photographic representation but rather a non-mimetic “clone” of the Real. The phenomenologically void visuality composed by Laruelle’s photographic clones is a “vision-in-One”: not a representation of the (non-visualizable) Real-One, but the manifestation of a “specific relation to the real” (The Concept 143, 6). Unlike philosophy’s attempts at remaking the Real in its own image, Laruelle’s non-philosophy aims at “[a] radical modification not of the World but of our vision(-in-One) of the World” (Principles of Non-Philosophy 190). This ambition, particularly as expressed through the matrix of non-photography, can be likened to the mediatic and sensorial project of McLuhan, whose “mosaic” resembles Laruelle’s vision-in-One. Both offer unilateral manifestations of the Real’s precession: not an illuminating and specular light on, but an opaque and vectorial light through. But what then to make of McLuhan’s frequent designation by communications scholars as a transformation theorist? Does not his celebrated re-description of the “matching” model inscribed in classical Information Theory as creative “making” disclose a nakedly philosophical pretension (“Environment” 118)? Our answer must be no. In common with Laruelle, it is our vision of the world that McLuhan aims to modify and whose prior modifications he painstakingly historicizes through case studies of specific media such as the printing press. The Real remains emphatically impervious to the mediatic (re-)“making” of McLuhan’s Man. McLuhan’s “medium” is not an alienated relation but something closer to what Laruelle terms a “unilateral duality”: a non-dialectical distance or (non-Kantian) transcendental. This notion of immanent distance is perhaps most powerfully conveyed by McLuhan’s influential theorization of the “Anti-Environment” (or counterenvironment) brought into visibility by the artist, which exposes habitually unseen aspects of the everyday without thereby negating them. Due to its quantum essence, the vectorial Real is, however, never deterministic, notwithstanding its unidirectional character. Smithson’s familiarity with McLuhan’s theses on media and perception is attested to by direct references in such texts as “A Museum of Language in the Vicinity of Art,” where he cites McLuhan’s notion, advanced by Understanding Media, that cinema generates a “Reel World” (91)—a postulate which we might retrospectively liken to Laruelle’s discourse on photo-fiction. Inspired by the form as much as the content of McLuhan’s writing, Smithson’s photo-essays do not so much represent a pervasively mediated world as elaborate intricate fictions conjugating photographic and philosophical materials. Another contemporary creator amenable to interpretation through a superposition of McLuhan’s aesthetic speculations with the non-aesthetic thought of Laruelle is the former Vancouver-based conceptual enterprise, N.E. Thing Co. Ltd. (NETCO, 1966-1978). From its 1966 founding by Canadian artist Iain Baxter (b. 1936), the fictional corporation was thoroughly McLuhanite in inspiration. Baxter had been early exposed to the media analyst through his participation in planning the 1965 McLuhan-themed Festival of the Contemporary Arts at the University of British Columbia (UBC), where he was then employed as an assistant professor. Notes for a “self-interview” delivered at UBC in the spring of 1965 deploy such McLuhanite terminology as “lineal,” “mosaic,” and “interplay of media,” the artist proposing that “macluen [sic] says [w]e must learn to arrange the sensory life in order to. . .fashion the environment itself as a work of art” (n.p.). In the same year as these initial engagements with McLuhan, Baxter joined forces with fellow Washington State University alumnus John Friel to form the artists’ collective IT, which also involved occasional contributions by future NETCO co-president, and Baxter’s then wife, Ingrid Baxter (b. 1938; known until 1971 as Elaine Baxter). Anticipating the corporate authorship of the N.E. Thing Co.—whose inhabitation of business frameworks would parallel McLuhan’s corporate “de-authorization” of Romantic constructions of the singular creator (Cavell, Remediating McLuhan 31)—IT’s products were the work of “more than one mind” (Baxter to Deborah, April 22, 1966). The anonymous participants of IT and NETCO simultaneously portend the “generic” humanity that Laruelle places in tension with the shared “Subject” of humanism and post-structuralism. Figure 1. IT, Pneumatic Judd, 1965. Courtesy Iain Baxter& and Raven Row. The disorienting familiarity of IT’s stock-in-trade was a calculated effect of the collective’s unconventional methodology of cloning artworks by the recognized names in contemporary art: from Donald Judd (Fig. 1) to Kenneth Noland and Claes Oldenburg. IT’s re-performance of well-known canvases and sculptures pointedly stripped their referents of all aesthetic pretension through an irreverent substitution of non-art materials betokening the generic textures of everyday life under late capitalism for the transcendent realms of formal autonomy or self-referentiality attributed to their prototypes by critics and art historians. 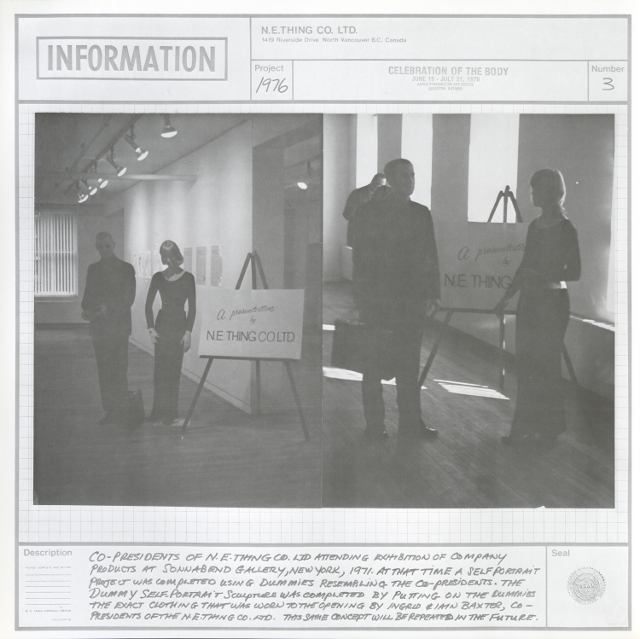 This cloning procedure would realize its apogee only after IT was subsumed within NETCO’s cunning “COP” (or Copy) Department when, in 1971, the co-presidents appeared as “dummies,” or clones of themselves, as part of a solo exhibition at the Sonnabend Gallery in New York (Fig. 2). More than a postmodern recognition of pervasive mediation, IT’s clones dramatize the foreclosure of the Real: transforming aesthetic objects into inert material for disarmingly generic fictions. Figure 2. N.E. Thing Co. Ltd., Dummy Self-Portrait Sculpture, 1971. Courtesy Iain Baxter& and Raven Row. In parallel with his involvement in IT, Iain Baxter experimented with techniques of non-verbal pedagogy that radicalized McLuhan’s critique of print-based classroom procedure. 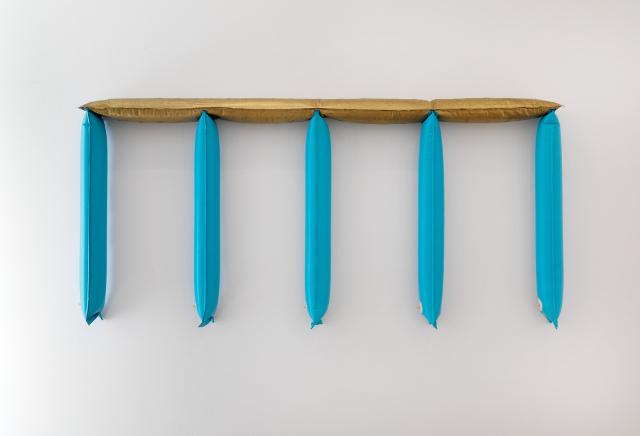 Incorporating found objects gleaned from his urban explorations, Baxter’s lectures at UBC and later at Simon Fraser University (SFU) mimed a choreography of generic actions (such as “swimming on dry land,” Fig. 3) to a rigorously abstract soundtrack of John Cage and Edgar Varèse (see Baigell and Smith 370). These interventions mounted a dramatic challenge to scriptural epistemology inspired by McLuhan’s audile-tactile speculations and incorporating Edward T. Hall’s insights on non-verbal communication (which, significantly, also served as a point of departure for McLuhan’s extension thesis). In Laruellian terms, non-verbal teaching constituted a “postural” thought in which, to quote John Ó Maoilearca, “ideas are turned into behavior” (144). The embodied “stance” (Laruelle, The Concept 12) that Baxter’s McLuhan-inspired non-verbal pedagogy substituted for the logical content of conventional teaching served as a gateway to the sensorial information products subsequently manufactured by the N.E. Thing Co.—the company itself being an indirect product of Baxter’s involvement in crafting a McLuhan-inspired “panaesthetic grammar” of the arts at SFU (Schafer, “Cleaning” 10). Figure 3. Iain Baxter, Non-Verbal Teaching (“Swimming on Dry Land”), ca. 1964-1966. Courtesy Iain Baxter& and Raven Row. NETCO was established as a transdisciplinary “umbrella” (Baxter, “Interview”) for the manufacture of a diversified product line envisioned as varieties of what company personnel termed “Sensitivity Information”: Sound Sensitivity Information, or SSI (“music, poetry [read], singing, oratory, etc.”), Moving Sensitivity Information, or MSI (“movies, dance, mountain climbing, track, etc.”), Experiential Sensitivity Information, or ESI (“theatre, etc.”), and Visual Sensitivity Information, or VSI (“a term developed and used by the N.E. Thing Co. to denote more appropriately the meaning of the traditional words ‘art’ and ‘fine art’ or ‘visual art’”) (“Glossary” n.p., Fig. 4). The company’s discipline-defying inventory and sensorial taxonomy resonated with the efforts of Baxter and fellow SFU faculty—notably composer and “soundscape” theorist R. Murray Schafer—to forge an interdisciplinary curriculum at the non-credit Centre for Communication and the Arts fueled by McLuhan’s non-Kantian hybridization of media and disparate disciplinary knowledges. Positioning themselves as pedagogues-at-large, the company’s co-presidents identified as public “educators of the senses” (Fleming 37). Sensitivity Information products generated by company researchers through their interactions with the environment were registered utilizing NETCO’s proprietary glossary of code-like Sensitivity Information acronyms (listed above), sometimes assuming the form of absurd formulae mocking the structuralist drive to mathematize knowledge. These were inscribed on generic “information forms,” designed by “Director of Information” Brian Dyson to serve as an infinitely extensible corporate archive. The greater part of these information forms documented the generic infrastructure of suburbia. Sitting somewhere between a conventional photo album and a McLuhanesque blueprint for social media image-sharing sites, the 1978 compendium of information forms, N.E. Thing Co. Ltd., Vol. 1, anticipates Mohammad Salemy’s recent likening of Instagram to the generic properties of Laruelle’s non-photography. Figure 4. N.E. Thing Co. Ltd., “Glossary,” 1966. Courtesy Iain Baxter& and Raven Row. The Company’s mock-psychophysical transcriptions of its corporate operations can be likened to the “economy of pure force” recorded by the oeuvre of August von Briesen in Laruelle’s perspicacious reading (“La plus haute” 144). Through a process akin to Surrealist modalities of automatic writing, or the techniques of psychophysical registration, or involuntary “writing down” (304), studied by German media theorist Friedrich Kittler, Briesen’s abstract drawings manifest “blind” transcriptions of musical performances, their seemingly random marks functioning somewhat akin to a “seismograph” (Galloway, Laruelle 163). 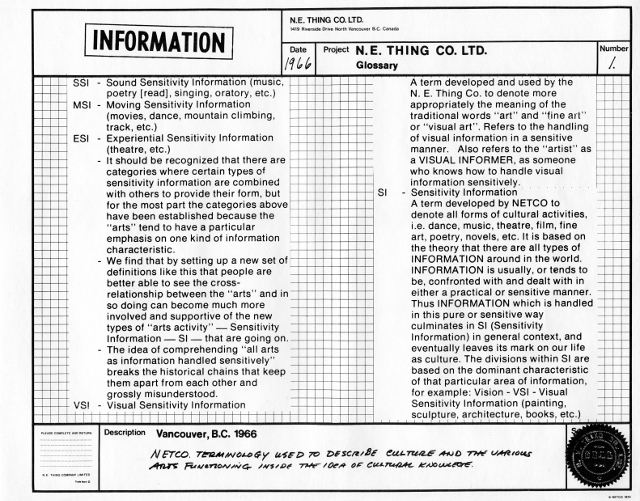 NETCO’s registrations of Sensitivity Information comprise analogously non-mimetic inscriptions of “affect and its intensity” (Laruelle, “La plus haute 144), having similarly developed in dialogue with musical performance (in NETCO’s case, R. Murray Schafer’s computational reimagining of conventional musical notation as a record of “exact frequencies” as well as Iain Baxter’s redeployment of Cage and Varèse within the context of his own gestural experiments in non-verbal teaching) (Schafer, The New Soundscape 3). Von Briesen’s blind inscriptions of musical performance manifest an audible-tactile Real comparable, moreover, to the acoustic space constituted by NETCO’s McLuhan-inspired corporate archive of Sensitivity Information. The intention of this admittedly somewhat perverse Laruellian reading of McLuhan and his artistic respondents is not to impose a false image of McLuhan as non-philosopher but, rather, to claim him as “material” for novel thought experiments that de-authorize canonical portraits of the media analyst, thereby opening up his percepts to new possibilities for non-standard usage. Without applying a Laruellian lens per se, the articles assembled by this special issue are exemplary demonstrations of just such a performative approach to McLuhan. Together, they constitute an appropriately fractalized image of the media analyst and his contested legacy. While they examine new territory and are wide-ranging in focus and methodology, the articles in this volume are assembled according to likenesses of theme and approach. The first two examine McLuhan’s interactions with artists he knew, his contemporaries Sorel Etrog and P. Mansaram. The next two identify points of continuity between McLuhan’s perspectives and contemporary work as well as points requiring adjustment and amendment, particularly in relation to Indigenous knowledge. Following these are two studies by artists who adapt McLuhan’s ideas in their own work. The remaining four articles are theory-oriented, each sounding McLuhan’s insights for resonances with current critical engagements. Both artists featured as McLuhan associates in the first two articles were newcomers to Canada, whose art reflects their encounter with the culture of Toronto as fresh and strange. Elena Lamberti animates a lesser-known collaboration that expands our sense of figure-ground interplay, between McLuhan and Sorel Etrog, the Romanian-born Canadian artist who passed away in 2014. In 1975, Etrog’s experimental film Spiral was shown at McLuhan’s Centre for Culture and Technology, triggering the collaborative publication based on that movie, Spiral. Images from the Film, published in 1987. Lamberti teases out Dadaist elements in Etrog’s montage, indicating how their assault on familiarity and conformity appealed to McLuhan and inspired his proposal to select stills and match them with a free-form text of quotations from various writers as well as original commentary. Lamberti points out that McLuhan himself can be understood as an artist who made a conscious shift from modernist avant-garde to neo-avant-gardes and the art forms of the 1970s. Apart from rounding out the record of McLuhan’s oeuvre by bringing this lesser-known project to light, Lamberti also pays homage to Etrog and his contribution to the Canadian artistic renaissance. Kuskis’s close reading of a McLuhan-inspired collage, Rear View Mirror 74, reveals how montage and mosaic are complementary in being fragmentary, co-authored, and multi-perspectival. Kuskis also exhumes the collaborative process of making: McLuhan hand-wrote several text passages onto the collage canvas, penciling in excerpts from sources he found compelling in literature and life. There is also a photograph of McLuhan mid-collage, taken by Mansaram and paying direct homage to McLuhan as inspiration. While McLuhan is frequently cast as artist in this volume, this article provides a concrete instance of his aesthetic activity. Speaking as a theorist grounded in French and Québécois tradition, Adina Balint draws on several of McLuhan’s key concepts to reveal how they remain vital to the interests and practices of three contemporary Canadian artists. She also demonstrates how they can serve as critical tools and vocabulary illuminating our understanding of three recent exhibitions of their art: Vision trouble, Our Land: Contemporary Art from the Arctic, and Superimposition: Sculpture and Image. These shows share a central drive to explore the interaction of perception, experience, and media, and she identifies four characteristics that for McLuhan distinguished our encounter with art: an appeal to the senses, viewer engagement, the creation of relationships, and recognition of the unseen or complexity that exceeds what can be perceived in everyday experience. Although Balint does not urge this connection, readers might want to consider how these artists are performing the key role of the artist as McLuhan saw it—to explain the environment, both human and human-made, from a stance at once atemporal and situated in space. Jessica Jacobson-Konefall, May Chew, and Daina Warren analyze Cree artist Cheryl L’Hirondelle’s multidisciplinary art work nikamon ohci askiy (songs because of the land), a piece that began as a technologically-recorded performance of L’Hirondelle’s walks through Vancouver city spaces in 2006 and endures as an interactive website. They present this work as an example of how Indigenous artists use digital media to explore their relation to the land—a relationship divergent from that of non-Indigenous colonizers with cultivated reliance on media as tool extensions. In place of roads cutting through land and settlements asserting property rights and ownership, L’Hirondelle’s art draws on a tradition of movement pathways of Indigenous ancestors across the land of North America. The authors argue that in Indigenous art, content is more important than form or medium, and that media are tools adopted by First Nations artists for purposes of circulation and engagement. For both contemporary artists represented here, McLuhan provides theoretical precedent and kinship. In his artist’s statement, Tom McGlynn complicates subject/object relations he identifies in the medium of photography and in his photographic work as related to McLuhan’s understanding of the photograph as both real and mediated. McGlynn links his decision to photograph incomplete worlds—“partial instantiations”—to McLuhan’s concept of the human encounter with external reality as being one of self-imposed limitation and incompletion. He accepts what he takes to be McLuhan’s challenge to avoid narrowing our gaze and our sensory lives by categorizing and naming, instead being receptive to perceptual shifts and environmental change. McGlynn points out that the photograph, for McLuhan, changed our relation to the object world, allowing the individual holding the camera to capture a view of reality at once detailed and holistic—yet at the same time, one limited by the photographer’s selective focus. He says that the objects he presents in his photographs should be understood as having lives of their own, and also as subjects of his composing. In “L(a)ying with Marshall McLuhan: Media Theory as Hoax Art,” Henry Adam Svec’s artist response examines media theory and hoax from his dual perspective as trained media theorist and hoax performance artist who has engaged in several projects that chase the question “wouldn’t it be fun if ?” He invokes Innis as an iconic “scholarly persona” whom he plays off against, and finds fellowship with McLuhan, who was both performer and trickster—what Lamberti refers to in this volume as a “sham” artist, a concept which, like Svec, she employs to refer to his practice of de-centering and de-familiarizing assumed patterns and practices with the grace of humour and even a measure of self-deprecation. Svec cites Glen Wilmot’s description of McLuhan as consummate mask-wearer, increasingly adept at the “put on.” In Svec’s assessment, McLuhan maintained agency and controlled his performative persona, combatting forces of media exploitation by crafting his image in deliberately staged performances. Whereas a common trope of hoax art is the ultimate “reveal,” where the performance culminates in a clarifying statement by the artist, Svec notes that McLuhan was entirely committed to the performative rhetorical process of lobbing probes to excite audience engagement or participation; he was willing to be perceived as gnomic guru, and avoided publishing a retrospective guide to assist the audience navigate his work via a script redacted to impose a particular form of consistency. It is this commitment to the play and refusal to break the spell by imposing temporal constraints that Svec admires as precedent-setting in his own hoax work. The final four essays offer theoretical examinations of McLuhan’s work that resonate with elements of the speculative turn—its materialism and realism, its rethinking of historicism, and its de-emphasis of the Subject through an engagement with the non-human (animal). Offering a longue durée of the “counterenvironment,” Kenneth Allan places McLuhan’s concept in relation to the other and prior expressions of “defamilarization” in art theory and practice, helping us to see shifts and continuities amongst users of this concept. While he does not dismiss the ways in which McLuhan put his signature on the idea, particularly in his response to the media environment of his cultural moment, Allan is interested in the broader contours of defamiliarization—its at least 200-year history—and reminds us not to “imagine that the idea emerges out of nowhere in the many instances of its appearance.” He provocatively links defamiliarization to the phenomenon of institutional critique, which probed the silent power of cultural systems, flipping the silent ground of institutional space into force fields shaping human attention and agency. By locating McLuhan’s use and development of the term within a historical context, Allan paradoxically reveals the extent to which McLuhan’s formulation was timely and original—a perspective that resonates with contemporary reassessments of historicism. Mohammad Salemy recuperates a significant media event, the first global satellite feed of a news show, BBC’s Our World (1967), which united an “estimated 500 million viewers in 24 countries” spatially and temporally. Salemy theorizes this form of “televisual intersubjectivity” as a new way of experiencing reality and time, with “accessible liveliness made a mediated experience almost as tangible, real and authoritative as any physical encounter with the world.” He differentiates this perspective from a Benjaminian understanding of temporality grounded in phenomenological experience, which filters present through past. He argues that for McLuhan virtuality adds another dimension—a “technologized intersubjective temporality,” which “includes technologies’ impacts on our understanding of that entity and of time itself.” Salemy establishes the importance of Our World as a media event, reproducing the transcript of the interview with McLuhan featured as part of the Canadian segment in which McLuhan explores themes including space/time acceleration, participatory engagement, and media history. According to Salemy, McLuhan emerges from this media event as an ahistoric mediator. Introducing the lens of critical animal studies, Jody Berland urges us to revise our understanding of McLuhan as a devoted humanist, arguing that McLuhan’s theory of extensions irrevocably moved away from anthropocentricism toward a posthumanist perspective heralding a nature/culture intersection. She notes that McLuhan was not only interested in media assemblage and machinic nature, but also in the broader environment and how it shapes “our participation in a common situation.” This is where animal lives play a role: Berland argues that McLuhan’s theory indirectly opens the door to new forms of human/machine interchange and assemblage which instantiate the notion that all forms and species are ecologically interdependent and co-evolving. Several recent theorists have employed affect theory to differentiate humanity from the machine world—Berland suggests that this theory may help move us beyond simply conceding that we have entered an ever-accelerating loop of exchange between humans and technology. It should be remembered that McLuhan emphasized feeling as a key ingredient of the Human, arguing that media amputations can induce narcosis. By contrast, animals assist us in feeling and even remind us of our losses: “the pleasure and anxiety of witnessing the merging of bodies, technologies, and nonhuman species.” While McLuhan never made this argument, Berland is likely accurate in thinking it is not one he would have opposed; namely, that we are implicated in animal and plant life, which, like the human world, is also caught up in processes of machinic change. By examining ourselves from a non-human perspective, we can respect animals’ struggles and experiences and potentially reconceive our own position within a shared ecology. Contributing to the media-archaeological project of unearthing lesser-known figures and materialities, Gary Genosko examines Harley Parker’s productive collaborations with figures other than McLuhan. Genosko presents the relatively unknown and still contested history of Flexitype—whose creation he attributes to Allan Fleming (who engineered the technology) and to Harley Parker (who pioneered experimental and creative applications)—to reveal the confluence of design innovation in late-1950s Toronto. 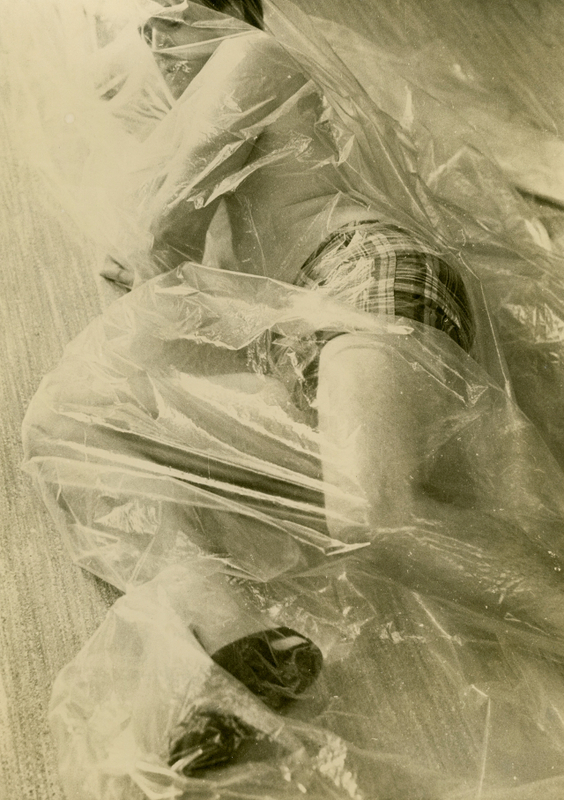 Genosko also examines links between father and son, tracing how Harley and son Blake Parker both experimented with the intensities of sensory experience and contributed to installation and performance art. This final essay explores how print-making processes contributed to the production of “non-books”—monographs conceived and constructed to disrupt the systematized and linear Gutenberg format. As Genosko observes, “such books may be analyzed as quasi-acoustic spaces, unbound from sound, remaking reading and repositioning the reader, injecting ambivalence and retaining tactility and inviting multi-sensory participation.” The mosaic-like non-book format pioneered by McLuhan and collaborators sets a compelling precedent for the fractalized form and content of the present volume. Allan, Kenneth R. “Marshall McLuhan and the Counterenvironment: ‘The Medium is the Massage.’” Art Journal, vol. 73, no. 4, 2014, pp. 22-45. Baigell, Matthew, and Joel Smith. “Happening in the Classroom: Non-Verbal Art Instruction.” Art Journal, vol. 25, no. 4, 1966, pp. 370-71. Baxter, Iain. “Self-interview.” 1965. Box 4, file 7. Iain Baxter& Fonds, E.P. Taylor Research Library and Archives, Toronto, ON. Typescript. Baxter, Iain, to Deborah. April 22, 1966. Box 6, file 6. Iain Baxter& Fonds, E.P. Taylor Research Library and Archives, Toronto, ON. Typescript. Baxter, Ingrid. “Interview.” 2009, http://vancouverartinthesixties.com/interviews/ingrid-baxter. Accessed 8 Aug. 2017. Web. Bergson, Henri. Laughter: An Essay on the Meaning of the Comic. 1911. Translated by Cloudesley Brereton and Fred Rothwell, Green Integer, 1999. Betts, Gregory, Paul Hjartarson, and Kristine Smitka, editors. Counterblasting Canada: Marshall McLuhan, Wyndham Lewis, Wilfred Watson, and Sheila Watson. U of Alberta P, 2016. Bryant, Levi, Nick Srnicek and Graham Harman. “Towards a Speculative Philosophy.” The Speculative Turn: Continental Materialism and Realism. Edited by Levi Bryant, Nick Srnicek, and Graham Harman, re.press, 2011, pp. 1-18. Campbell, SueEllen. The Enemy Opposite: The Outlaw Criticism of Wyndham Lewis. Ohio University Press, 1988. Cavell, Richard. McLuhan in Space: A Cultural Geography. U of Toronto P, 2002. ___. Remediating McLuhan. Amsterdam UP, 2016. Churchward, James. The Lost Continent of Mu. 1931. Paperback Library, 1968. Crocker, Stephen. Bergson and the Metaphysics of Media. Palgrave Macmillan, 2013. Crow, Thomas. “Cosmic Exile: Prophetic Turns in the Life and Art of Robert Smithson.” Robert Smithson. Edited by Eugenie Tsai et al., U of California P, 2004, pp. 32-74. Deleuze, Gilles. Bergsonism. 1966. Translated by Hugh Tomlinson and Barbara Habberjam. Zone Books, 1988. ___. The Logic of Sense. 1969. Translated by Mark Lester with Charles Stivale, Continuum, 1990. Deleuze, Gilles and Félix Guattari. What is Philosophy? Columbia UP, 1991. Donnelly, Ignatius. Atlantis: The Antediluvian World. 1882. Dover, 1976. Edwards, Paul. Wyndham Lewis: Painter and Writer. Yale UP, 2000. ___. “Wyndham Lewis’s Vorticism: A Strange Synthesis.” The Vorticists: Manifesto for a Modern World. Edited by Mark Antliff and Vivien Greene,Tate, 2010, pp. 35-45. Fleming, Marie L. Baxter2: Any Choice Works. Art Gallery of Ontario, 1982. Galloway, Alexander R. Laruelle: Against the Digital. U of Minnesota P, 2014. Henderson, Linda Dalrymple. Duchamp in Context: Science and Technology in the Large Glass and Related Works. Princeton UP, 1998. Hokenson, Jan Walsh. “Comedies of Errors: Bergson’s Laughter in Modernist Contexts.” Understanding Bergson, Understanding Modernism. Edited by Paul Ardoin, S.E. Gontarski, and Laci Mattison, Bloomsbury Academic, 2013, pp. 38-53. Kittler, Friedrich A. Discourse Networks 1800/1900. Translated by Michael Metteer with Chris Cullens. Stanford UP, 1990. Lamberti, Elena. Marshall McLuhan’s Mosaic: Probing the Literary Origins of Media Studies. U of Toronto P, 2012. Laruelle, François. “La plus haute des contemplations.” Réflexions philosophiques sur l’oeuvre d’August v. Briesen. Fondation Brandenburg-Neumark, 1985, pp. 141-73. ___. “A Light Odyssey: La découverte de la lumière comme problème théorique et esthétique.” Le Confort Moderne, 1991. ___. “Of Black Universe in the Human Foundations of Color.” Hyun Soo Choi: Seven Large-Scale Paintings. Translated by Miguel Abreu, Thread Waxing Space, 1991, pp. 2-4. ___. Philosophies of Difference: A Critical Introduction to Non-Philosophy. 1986. Translated by Rocco Gangle, Continuum, 2010. ___. “Is Thinking Democratic? Or, How to Introduce Theory into Democracy.” Laruelle and Non-Philosophy. Edited by John Mullarkey and Anthony Paul Smith, Edinburgh UP, 2012, pp. 227-37. ___. Photo-Fiction, a Non-Standard Aesthetics. Translated by Drew S. Burk, Univocal, 2012. ___. Principles of Non-Philosophy. 1996. Translated by Nicola Rubczak and Anthony Paul Smith, Bloomsbury Academic, 2013. ___. Intellectuals and Power: The Insurrection of the Victim; François Laruelle in Conversation with Philippe Petit. 2003. Translated by Anthony Paul Smith, Polity, 2014. ___. The Concept of Non-Photography. Translated by Robin Mackay, Urbanomic/Sequence, 2015. Lewis, Wyndham. Men Without Art. Russell & Russell, 1930. ___. The Apes of God. 1930. Penguin, 1965. ___. A Soldier of Humor and Selected Writings. Edited by Raymond Rosenthal, Signet, 1966. ___. Journey into Barbary. 1932. Edited by C. J. Fox, Black Sparrow, 1983. Luisetti, Federico, and David Sharp. 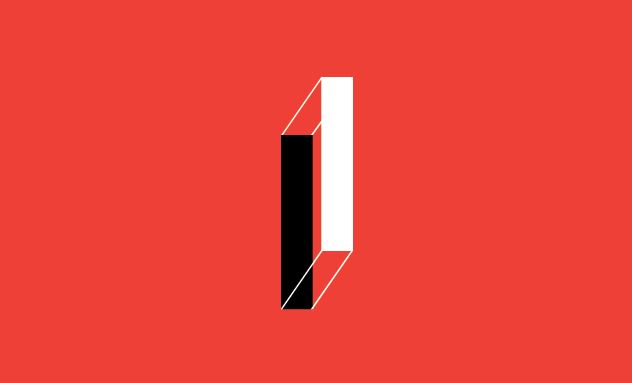 “Reflections on Duchamp: Bergson Readymade.” Diacritics, vol. 38, no. 4, 2008, pp. 77-93. Mackay, Robin, and François Laruelle. “Introduction: Laruelle Undivided.” From Decision to Heresy: Experiments in Non-Standard Thought. Edited by Robin Mackay, Urbanomic, 2012, pp. 1-32. Marchessault, Janine. Marshall McLuhan: Cosmic Media. Sage, 2005. McLuhan, Marshall. Counterblast. s.n., 1954. ___. “The Analogical Mirrors.” The Kenyon Review, vol. 6, no. 3, 1944, pp. 322-32. ___. The Mechanical Bride: Folklore of Industrial Man. Vanguard Press, 1951. ___. The Gutenberg Galaxy: The Making of Typographic Man. U of Toronto P, 1962. ___. Understanding Media: The Extensions of Man. McGraw-Hill, 1964. ___. “Art as Anti-Environment.” Art News Annual, vol. 31, 1966, pp. 55-57. ___. “Environment as Programmed Happening.” Knowledge and the Future of Man: An International Symposium. Edited by Walter J. Ong, Holt, Rinehart and Winston, 1968. McLuhan, Marshall, and Wilfred Watson. From Cliché to Archetype. Viking, 1970. Michaels, Adam. “Foreword.” The Electric Information Age Book: McLuhan/Agel/Fiore and the Experimental Paperback. Editing by Jeffrey T. Schnapp and Adam Michaels, Princeton Architectural Press, 2012. Miller, Tyrus. Late Modernism: Politics, Fiction, and the Arts Between the World Wars. Un of California P, 1999. Molinaro, Matie, Corrine McLuhan, and William Toye, editors. Letters of Marshall McLuhan. Oxford UP, 1987. N.E. Thing Co. Ltd. “Glossary.” 1966. box 5, file 11. Iain Baxter& Fonds, E.P. Taylor Research Library and Archives, Toronto, ON. Typescript. ___. N.E. Thing Co. Ltd., Vol. 1. Vancouver: N.E. Thing Co. Ltd., 1978. Ó Maoilearca, John. All Thoughts Are Equal: Laruelle and Nonhuman Philosophy. U of Minnesota P, 2015. Pressman, Jessica. Digital Modernism: Making It New in New Media. Oxford UP, 2014. Salemy, Mohammad. “Instagram as Non-Photography.” Third Rail, vol. 1, 2013, pp. 33-36. Schafer, R. Murray. “Cleaning the Lenses of Perception.” artscanada, vol. 25, no. 4, 1968, pp. 10-12. ___. The New Soundscape. BMI Canada, 1969. Smith, Anthony Paul. Laruelle: A Stranger Thought. Polity, 2016. Smithson, Robert. “A Museum of Language in the Vicinity of Art.” 1968. Robert Smithson: The Collected Writings. Edited by Jack Flam, U of California P, 1996. ___. “Entropy and the New Monuments.” 1966. Robert Smithson: The Collected Writings. Edited by Jack Flam, U of California P, 1996, pp. 10-23. ___. “Incidents of Mirror-Travel in the Yucatan.” 1969. Robert Smithson: The Collected Writings. Edited by Jack Flam, U of California P, 1996. Theall, Donald F. The Medium is the Rear View Mirror: Understanding McLuhan. McGill-Queen’s UP, 1971. ___. The Virtual Marshall McLuhan. McGill-Queen’s UP, 2001. “McLuhan obviously is, as he himself declared, not a philosopher, a theorist, or a traditional scientist. . .but rather an artist playing with percepts and affects” (Theall, The Virtual Marshall McLuhan 13). “We can read [McLuhan] as an artist who creates tools that foreground the ethics of reflexive methodologies” (Marchessault, Marshall McLuhan xix). “McLuhan found himself at odds with the regnant theories of his time, especially the linguistic metaphor that informed structuralism, post-structuralism and deconstruction” (Cavell, Remediating McLuhan 10). “McLuhan particularly invoked the new physics as support for his critique of visual space, drawing on Heisenberg’s use of the term ‘resonance’ in his account of quantum mechanics to argue in The Gutenberg Galaxy that the random state in physics was cognate with the auditory domain” (Cavell, Remediating McLuhan 93). “In the beginning there is Black” (Laruelle, “Of Black Universe” 2; see also Galloway, “The Black Universe”; Laruelle, “A Light Odyssey”). McLuhan’s immanental orientation can also be traced to Scotist elements in the writings of James Joyce, also noted by Theall (see The Virtual Marshall McLuhan 74). An early influence on McLuhan was the neo-Scotist Catholic poet Gerard Manley Hopkins (see McLuhan, “The Analogical Mirrors”). “McLuhan, by mid-career. . .increasingly sought to address himself to artists and, more radically, to be understood as an artist himself” (Cavell, Remediating McLuhan 79). “[M]odelling the name ‘non-philosophy’ on an analogy with ‘non-Euclidean geometry,’ Laruelle proposes a broadened, pluralistic science of thought and philosophy as well as a major reworking of philosophical concepts” (Ó Maoilearca, All Thoughts Are Equal 8). Smithson’s personal library, preserved today with his papers at the Archives of American Art, contains a Signet paperback anthology of Lewis’s writings that includes excerpts from his 1932 Moroccan travelogue, Filibusters in Barbary (see Lewis, A Soldier of Humor, Journey into Barbary). “Well before the invention of the corresponding technology, a veritable automatism of photographic repetition traverses western thought” (Laruelle, Photo-Fiction 2). “We call ‘unilateral duality’ or ‘dual’ the identity without-synthesis of a duality where identity is assumed by the first term or more precisely its clone, not by the second, and duality by the second alone and not by the first” (Laruelle, Principles of Non-Philosophy 130, original emphasis).